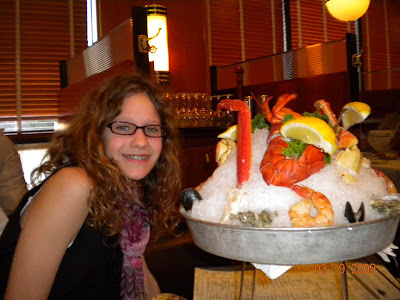 Oceanaire in Minneapolis was the place we chose to take Katie for her "13th special night out." This is a tradition we started with Andrew on the kids' 13th birthdays where we dress up and take just the birthday child out to a very "grown up" and fancy restaurant. Here she is with the "Seafood Tower." Very nice. We had a great time hearing about what's been going on in school and how she's feeling about being a teenager. Katie has a vibrant, passionate personality that is a lot of fun to be around. 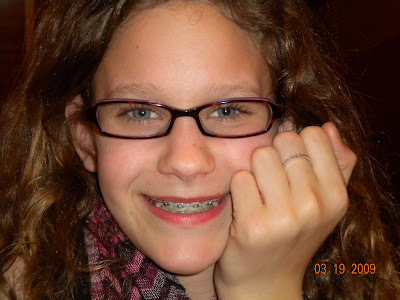 Here she is showcasing the purity ring we gave her. 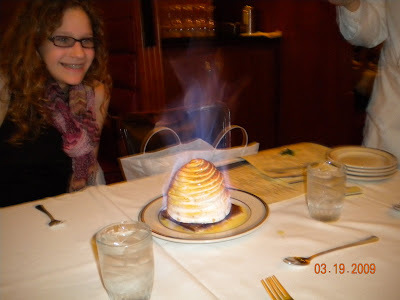 They surprised us with a complimentary Baked Alaska for dessert in honor of her birthday! Since we hadn't ordered anything, we were a little set back...in fact Katie, having never seen such a thing wasn't sure if it was fish or what! It was a dramatic end to a great evening with our newest teenager. AHHHH! HAPPY BIRTHDAY BEAUTIFUL KATIE!!!! We wish we could give you lots of birthday hugs--we'll save them up for this summer. Get ready! That will be a lot of hugs from a lot of little Curries.